Happy February beauties! Phew, I am so happy that January is over and even though it wasn’t the best month for me on personal level, beauty wise it was pretty darn amazing. I’ve discovered two skincare bits that have already transformed my skin and it looks better than it ever has! As if that’s not enough – the makeup bits that I’ve been using boosted my confidence so much more and I cannot wait to tell you all about them. So grab a cuppa and enjoy my thoughts on the products I’ve been obsessing over lately. Oh and keep your wishlist at the ready – I’m pretty sure new goodies will be added at the end of the post! Ever believed that miracles in little white jars existed? 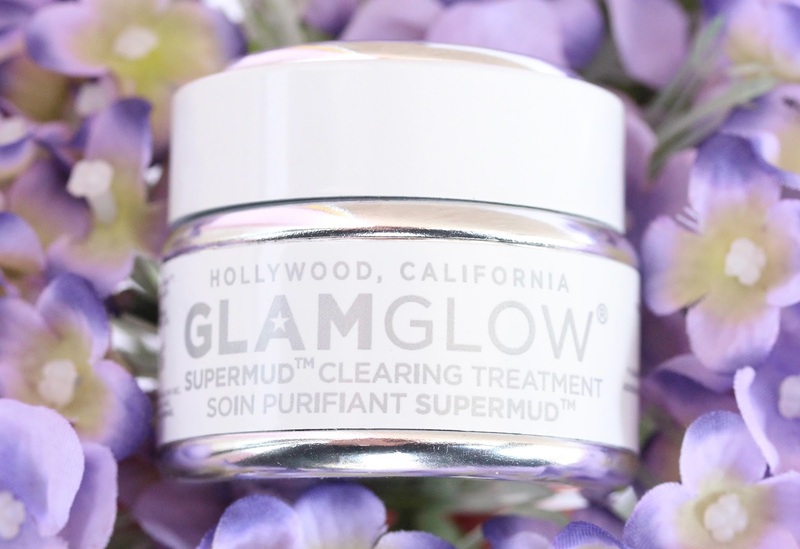 Yeah, we’ve all heard about the magic properties of the GLAMGLOW Supermud mask and I am here to report back – this stuff really does work wonders! In minutes. I adore the instant results this gives me and my skin has never looked better. The Supermud mask cleanses the deeper layers of the skin, leaving it look and feel really clean and healthy. The white and black heads I’ve been dealing with for years have almost vanished and I’ve been having a lot less breakouts. When I do have them though, I just pop some of the product on top and within minutes it takes care of it – it is less red, not as swollen and it heals almost completely within the day! Incredible! I’ve also noticed that the size of my pores is minimized and my skin is softer and smoother. GLAMGLOW is the best skincare product I’ve ever tried and you need to get involved – you will be smitten by it – it’s love! Putting oil on my face has always sounded a little bit weird and daunting but I needed to jump on the bandwagon and see why so many people swear by them. And oh my Goodness – where have they been all my life!? This Treatment Oil by Clarins has improved my skin SO much and I still cannot believe the difference it has made! I’ve been using the oil three times a week and I can’t fault it. The moisture is back into my skin and it is so supple and healthy. When using this, my pores are nowhere to be seen and my skin is so calm and soft. I also feel like the oil helps fade any acne scars that I may have, and my complexion is even and redness is not an issue anymore. Overnight miracle! 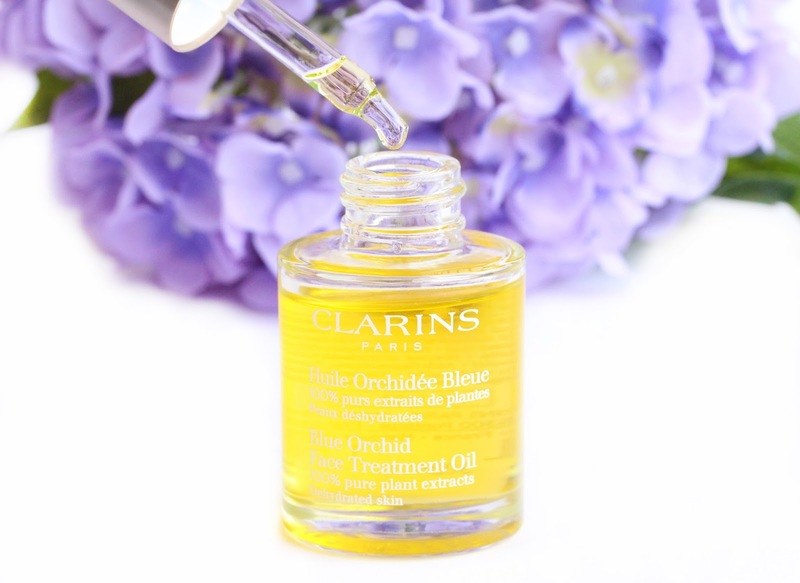 Blue Orchid is specifically designed for dehydrated skin but Clarins also offer Treatment oil for dry skin and one for oily. Having terrible nightmares this past month has at least done something good – helping me go through my stash and discover my ideal under eye concealer. The lack of sleep took its toll and so did the cold weather so when I rediscovered Benefit Fake Up concealer I couldn’t be happier! Concealer that not only hydrates my ridiculously dry under eye area but it also covers everything and doesn’t crease? 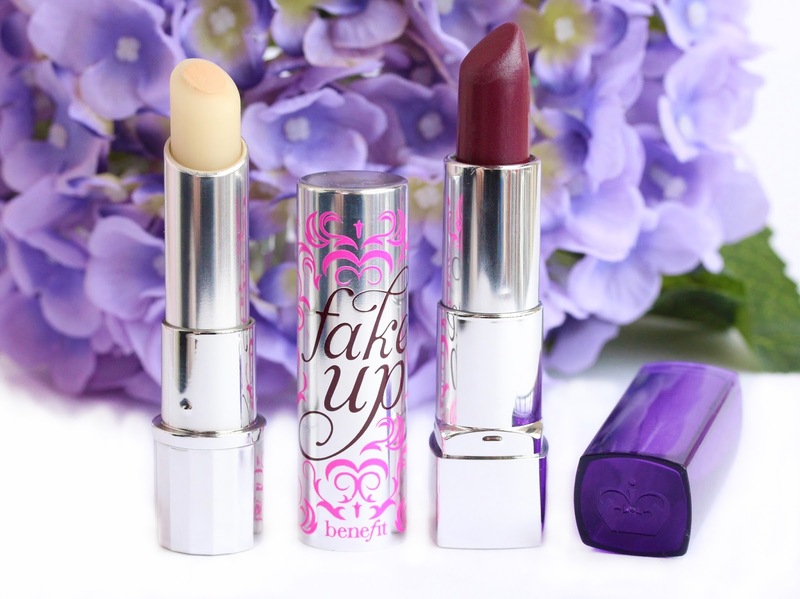 Yep, that's right – this little lipstick-looking gem does it all for me! Fake Up consists of two components – outer ring with Vitamin E and apple seed extract and the center, which is the concealer itself. Cool formula, which at first may seem a bit greasy but when blended and set with powder will guarantee you long-lasting coverage, hydration and natural looking, brighter under eye area. Loving. It. You know how I bang on about my love of the Too Faced LashGASM Mascara? Even I got tired of raving about it so I decided to branch out and try something new. 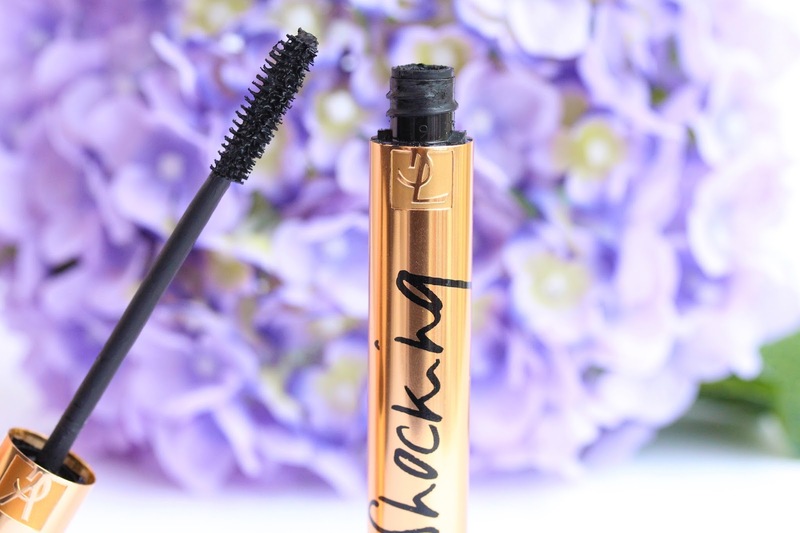 The lucky winner was this YSL Shocking Mascara, which I’ve been wearing, non-stop during January and let me tell you – it’s downright amazing! Long lashes – check! Incredible volume – check! Perfect separation – check! No clumps – check! The list goes on – this baby does it all! It gives that dramatic look to my lashes, which I adore and yes, it is probably too much for the daytime but I love me the ‘false lash’ effect, I can’t help it. You know I love me a good vampy lipstick and looks like Sloane’s Plum (review here) has completely stolen my heart. I have been wearing it pretty much all the time for the past couple of months and I can’t get over how stunning it is! The shade is so sophisticated and classy and it’s the ultimate confidence booster. The formula is spot on as well, with its non-drying, long-lasting properties and the glossy finish is just to die for. Affordable perfection in a tube. Love the Clarins Oil! Beautiful pictures! Really great favourites this month! I've used the Clarins oil for oily skin for about two years now and I'm currently finishing my fourth or so bottle, I don't ever want to part with it. There's literally nothing that cured my skin from breakouts and oiliness than this baby, I can absolutely recommend it. Beautiful pictures and products! Amazing blog you have. I love the YSL shocking mascara too! The YSL Mascara is such a great product, I love it too! I need the glamglow in my life!! Love your pictures! I really want to try YSL shocking. The Rimmel Moisture Renew lippies are AMAZING, I have two and i'll definitely be expanding my collection- I just love them so much! And they're so affordable! I love Clarins Blue Orchid oil!! I put my shocking mascara away, but maybe its time to try it again. i love the flowers you used it your photos, looks gorgeous! makes the items pop beautifully! I haven't tried any of these products but I really want to try out the Benefit concealer. The Clarins oil sounds amazing! The Benefit concealer looks good too! I haven't tried any of these but I want to try the Clarins Blue Orchid Oil the most of all of these products! I'm saving up for it to give it a go. I love this post! I really really want to try the YSL shocking mascara! 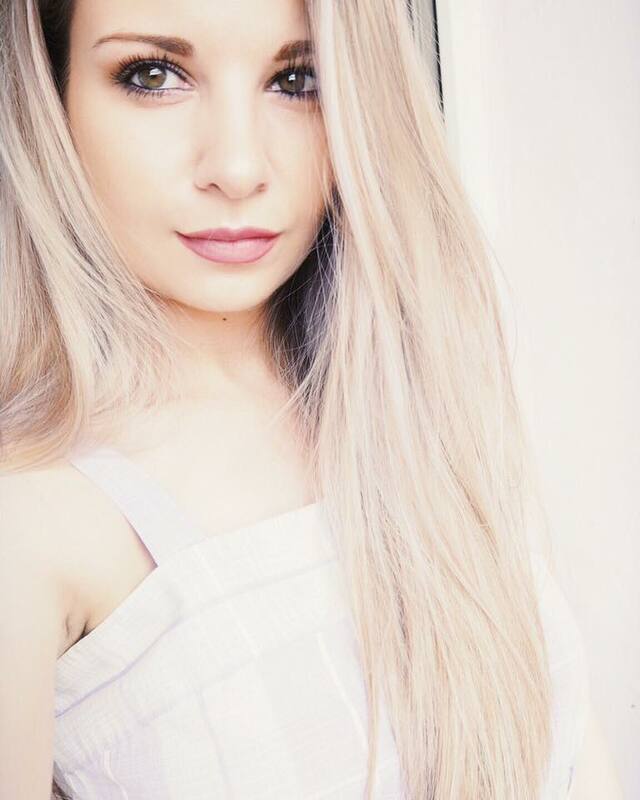 I can't express how much I love YSL Shocking, so much better then the Baby Doll eyes which seems to get more hype! I have not tried any of the products, which are mentioned in the post. 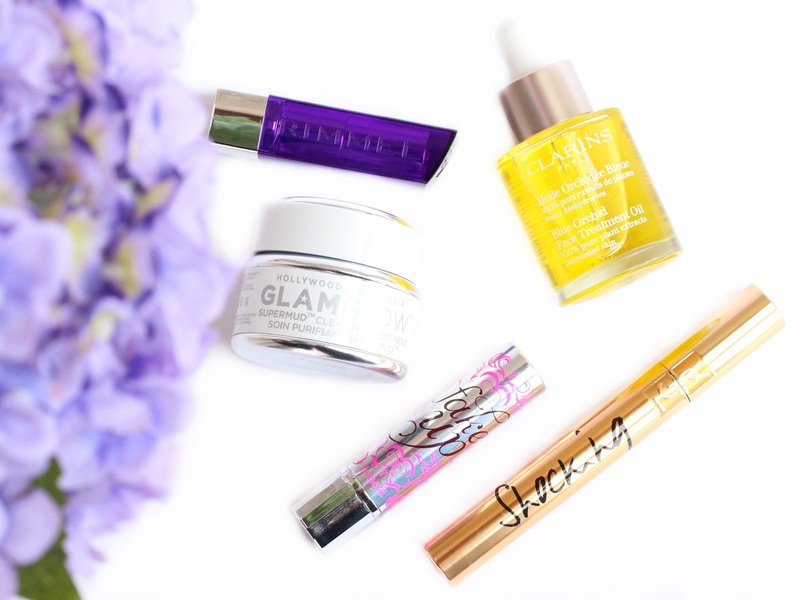 The GLAMGLOW Supermud Clearing Treatment and Clarins Blue Orchid Treatment Face Oil seem interesting to try. Is the supermud applies to any skin type? And can I use the face oil as a moisturizer? I will definitely check this out.